Oil Filled Air Compressor Market size will surpass USD 25 billion by 2024; according to a new research report by Global Market Insights, Inc.
Industrial manufacturing is the major growth sector for global economy with diverse companies across general manufacturing, furniture manufacturing, plastic, silicone and rubber manufacturing, and metal fabrication, to name some. The use of oil filled air compressor in these industries to generate a continuous source of durable, dependable, and efficient pressurized air will boost the product market. Asia Pacific is one of the most significant regions with industrial development driven by the increase in several government as well as private initiatives. For instance, the Prime Minister of India launched ‘Make in India’ and ‘Foreign Direct Investment’ initiatives to make the country a global manufacturing hub. The manufacturing sector of India grew at a growth rate of 7.7% in 2017 and will continue to grow at a significant rate, thus promoting the product market demand by 2024. The increasing use of oil free air compressor in various sectors such as food & beverage, medical, healthcare, semiconductor will hinder the oil lubricated air compressor market. The oil free air compressor is lighter in weight which allow the machine itself to be carried easily. According to U.S. Food and Drug Administration, the air used in food & beverage industry should be completely free of oil, water and other contaminants. This will increase the demand of oil free types and providing restraints to the oil lubricated air compressor market. Oil filled air compressor are classified on basis of product, technology, application and region. Based on product, the same market is categorized into stationary and portable. 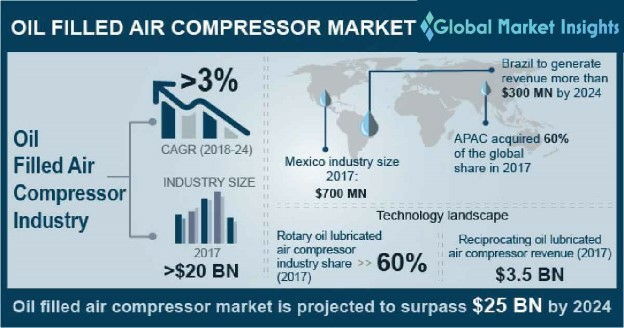 Based on revenue, stationary oil filled air compressors will account for over USD 15 billion in 2024 growing at a substantial rate throughout the forecast spell. Based on technology, oil lubricated air compressor is segmented as centrifugal, rotary and reciprocating. On revenue basis, centrifugal oil lubricated air compressor will account for more than 35% of the entire market size in 2024. These are majorly used in industrial application requiring high capacity, large discharge rates and continuous operations. Based on application, oil filled air compressor industry is segmented into energy, mining & quarrying, building & construction, oil & gas, manufacturing, home appliances, electrical & electronics and others. Energy sector is likely to generate revenue over 370 million, growing at a substantial rate during the forecast time period. The installation of new thermal power plants in the Asia Pacific region will drive the oil filled air compressor market. For instance, China will install more than 160 and India install more than 50 new power plants during forecast timeframe. Brazil oil lubricated air compressor market is likely to generate revenue over USD 300 million at the end of the forecast spell due to positive growth in mining industry. The mining sector accompanies almost 7% of its GDP due to increasing investments by the government and other mining groups. Major participants in the oil lubricated air compressor market which holds the key chunk include Sullair LLC, Ingersoll-Rand plc, Atlas Copco, Gardner Denver, Inc., Doosan Portable Power, Kaeser Kompressoren SE, Hubei Teweite Power Technology Company Limited, and Sullivan-Palatek, Inc.